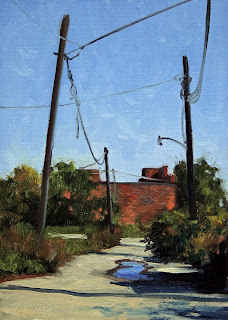 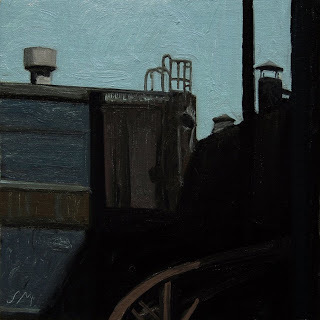 Detroit Landscape #2, oil on canvas panel, 5"x7"
This scene is of warehouses along an old rail bed looking towards downtown. 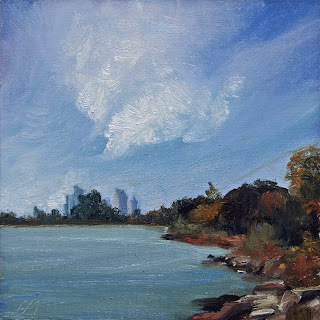 Belle Isle View, oil on canvas panel, 5"x5"
I painted this view of the GM Building from Belle Isle with the clouds and ice crystals above, before I heard about GM merging with Chrysler. 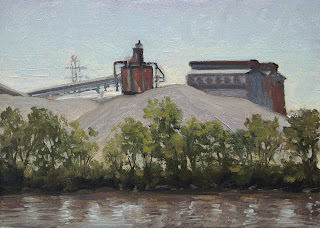 Big Red, Belle Isle Landscape, oil on canvas panel, 7"x5"
J.W.Shelley, oil on canvas panel, 5"x7"
Pioneer Sugar, oil on canvas panel, 7"x5"
We took a road trip thru the flatlands of Ohio a few days ago to see Janet's father. 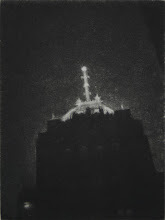 I had a chance to get some nice shots. 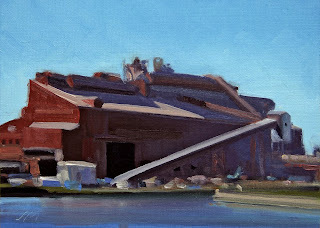 These storage silos are for Pioneer Sugar. 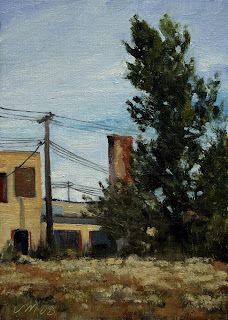 I grew up in Northern Ohio and one of the crops we grew was sugar beets. 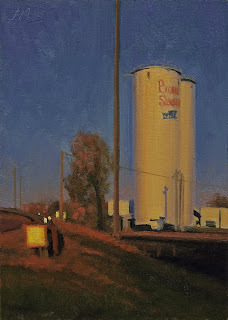 These silos are near Finley, Ohio. 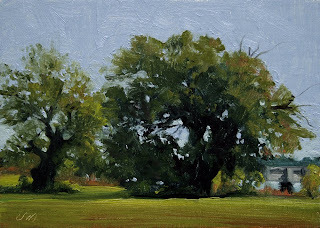 The late afternoon light was very nice. 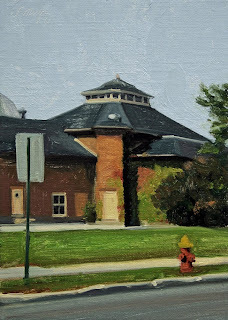 The Yellow House, oil on canvas panel, 7"x5"
One of our favorite places to eat is the Cass Cafe. 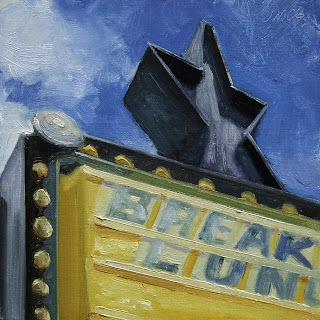 A fun cafe that has changing arwork shows on their walls that are for sale. 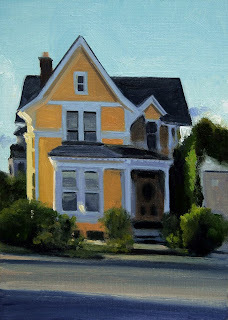 When you leave at the end of their alley is this wonderful yellow house. 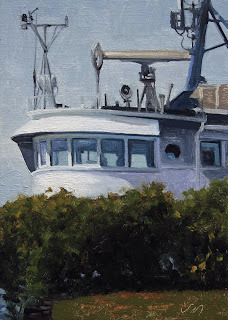 The light was just right this day. 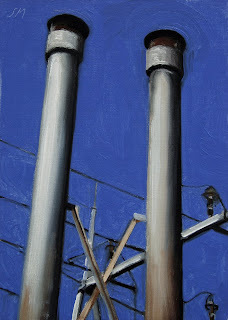 Rouge Stacks, oil on canvas panel, 7"x5"
Detail of Rouge stacks and power lines against a deep cobalt sky. 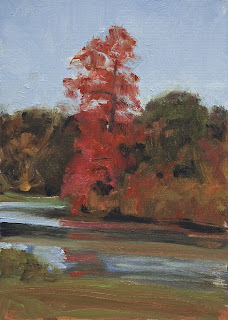 Rouge Landscape #4, oil on linen panel, 5"x7"
This is a larger painting that was done as a commission. 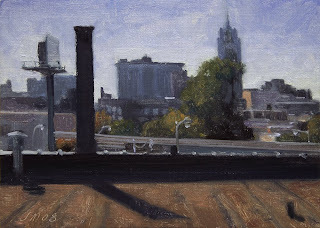 Eastern Market Landscape, oil on linen panel, 5"x5"
Rooftop landscape in Detroit's Eastern Market. 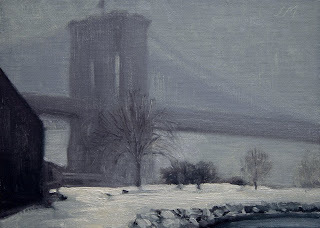 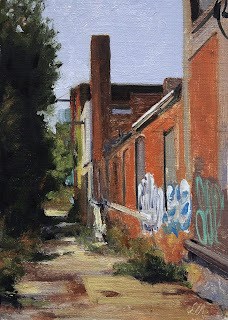 Dark Shadows, oil on linen panel, 5"x5"
Brooklyn Bridge #7, oil on linen panel, 5"x7"
Alley Tags, oil on linen panel, 7"x5"
Graffiti Tags on warehouse district buildings. 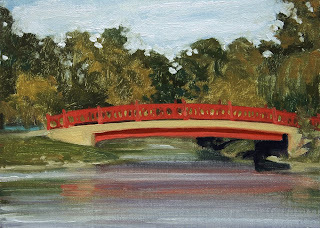 Belle Isle Patriarchs, oil on linen panel, 5"x7"
Belle Isle Red, oil on linen panel, 5"x7"
One of several beautiful bridges on Belle Isle..
Dossin Great Lakes Museum, oil on linen panel, 7"x5"
Belle Isle Aquarium, oil on linen panel, 7"x5"
Star Breakfast, oil on linen panel, 5"x5"
Funky restaurant sign, Star breakfast and lunch. 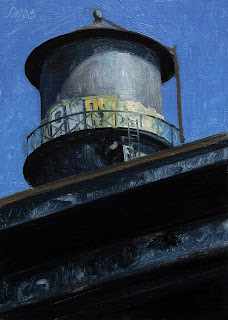 Eastern Market Watertank, oil on linen panel, 7"x5"
Beautiful tagged watertank in the Eastern Market area of Detroit. 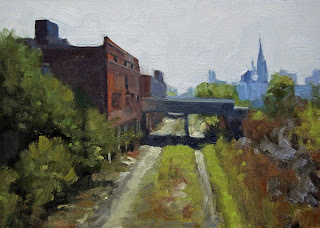 Warehouse District, oil on linen panel, 7"x5"
Shades of Gray, oil on linen panel, 5"x5"
Curving overpass with shadows. 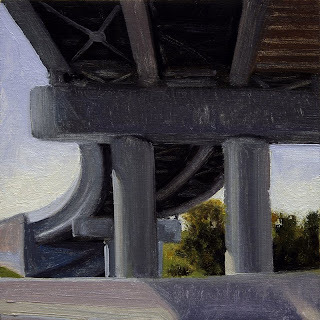 When I see these I always think of our last cat Duchamp, as we would pass under these overpasses he would always duck his head. 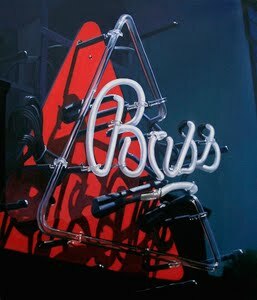 The thought still makes me smile. 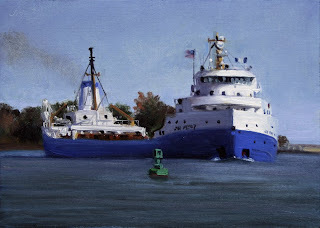 Midtown Landscape, oil on linen panel, 5"x7"
Peter R. Cresswell, oil on linen panel, 5"x7"
The Peter R. Cresswell heading upbound on the Detroit River. 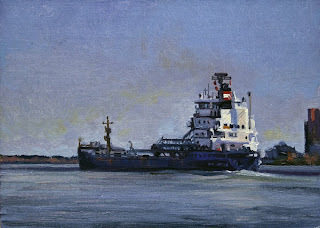 built by Colllingwood shipyards in 1982, converted to a self-unloader by Port Weller Dry Docks, St. Catharines, ON, in 1998. 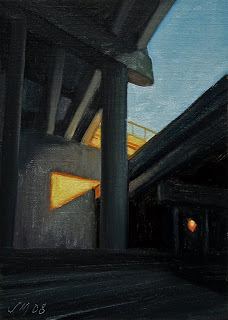 Overpass Shadow, oil on linen panel, 7"x5"
Shadows at the intersection of Woodward Ave and I-696. 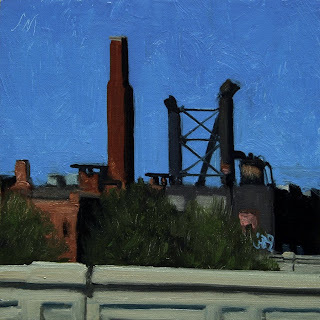 This is about a half mile from our house and everytime we drive under the bridge I think I should really paint this. 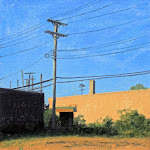 The light was just right the other night so here it is. 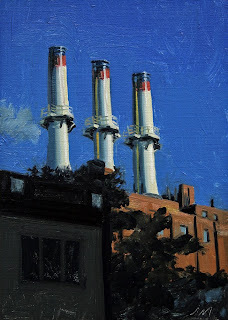 Brush Park Alley, oil on linen panel, 7"x5"
Downriver Landscape #2, oil on linen panel, 5"x7"
Midtown Stacks, oil on linen panel, 7"x5"
Late afternoon sunlight on a Midtown Powerplant against a deep blue sky. 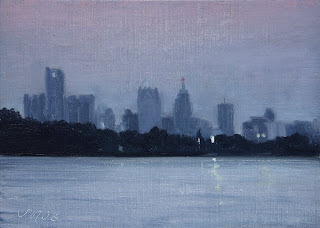 Detroit at Dusk, oil on linen panel, 5"x5"
Part of the Detroit skyline at dusk, can't seem to stay away from these nocturnes. 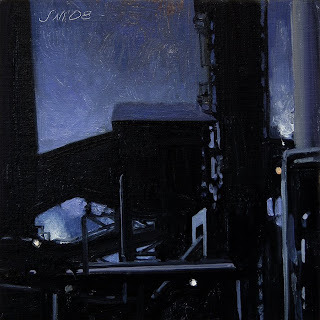 Rouge Nocturne #3, oil on linen panel, 5"x5"